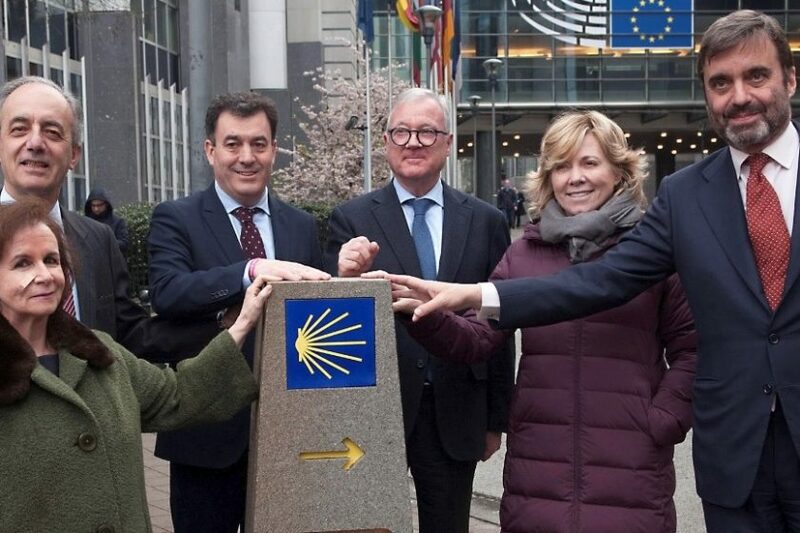 The Regional Minister for Culture and Tourism, Román Rodríguez, today presided over the placing of a milestone on the Camino de Santiago in the European Parliament. The regional leader, accompanied by the vice-president of the European institution, Ramón Luis Valcárcel, discovered this symbolic milestone in the access of visitors to the European Parliament. Throughout the ceremony, the Regional Minister stressed that the stone element installed in the heart of the European Union symbolises the Pilgrim’s Way to Santiago, which is “the first germ that gave rise to the unity of Europe”. This milestone will share space at the entrance to the European Parliament with a piece of the fallen Berlin Wall. The milestone installed in the access to the European Parliament contains the main symbols of the Way: the shell, one of the oldest and most representative of the Jacobean Route; the yellow arrow, which indicates the correct direction, and the kilometric point that indicates the distance of 1,318 kilometers to the Cathedral of Santiago.